Drainpipe trousers re-emerged in the 1950s, with popular Western stars such as the singing cowboy Roy Rogers, The Lone Ranger, The Cisco Kid, Zorro and Gene Autry and actresses Marilyn Monroe and Sandra Dee wearing their pants very slim to the ankle from 1955 onwards. 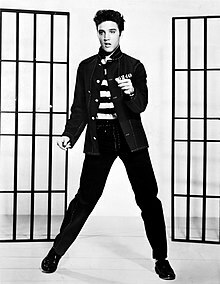 Tapered jeans became most notable with country music stars and with the birth of rock and roll in the 1950s, when Elvis Presley donned slim-fitting jeans and shocked the country. In the early 1960s, drainpipes were worn by numerous rock bands and musicians, including The Beatles, The Rolling Stones and Bob Dylan. Fashion icon Audrey Hepburn also raised the popularity of drainpipe jeans. Slim fitting pants and jeans were worn not just by members of the teenage Mod or greaser subculture but also ordinary people. 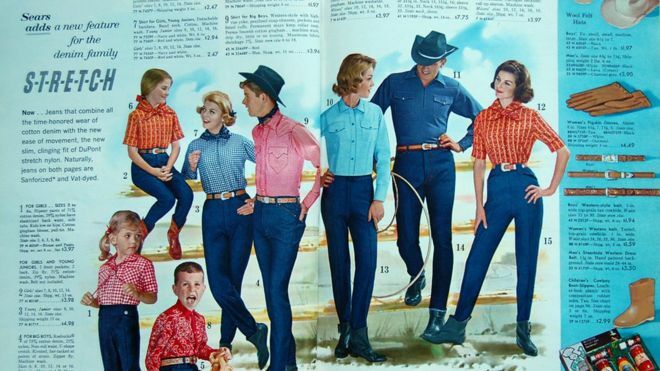 By 1962, Sears were selling tight jeans made from "stretch" denim that incorporated elastane. The trend lasted until the end of the 1960s when "hippie" culture gave rise to flared pants and bell bottom jeans. ^ Smith, Ray A. (6 July 2009). "Tight Squeeze: Making Room For a New Men's Fashion". The Wall Street Journal. New York. ^ ^ Yule, Henry and A. C. Burnell. 1903. Hobson-Jobson: A Glossary of Colloquial Anglo-Indian Words and Phrases, and of Kindred Terms, Etymological, Historical, Geographical and Discursive. London: John Murray. 1021 pages. ^ "Sears catalog 1962". BBC. Archived from the original on 21 December 2018. Retrieved 21 December 2018. ^ "Skinny legs and all: Jeans get slender". usatoday. Retrieved 9 April 2014. ^ "Blink and You Missed It". Retrieved 8 August 2014. ^ "Skinny Jean". Time. Retrieved 19 June 2014. ^ Smith, Ray A. (July 6, 2009). "Tight Squeeze: Making Room For a New Men's Fashion". The Wall Street Journal. New York. Archived from the original on 2013-06-04. Retrieved November 30, 2011. 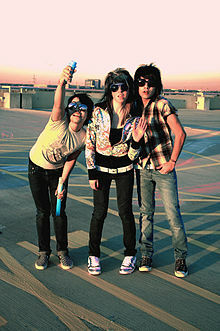 ^ "Jerkin' Jeneration". Los Angeles Times. May 31, 2014. ^ Kim So-hee (2013-04-06). "스키니진이 우리에게 미치는 악영향". medicaldaily. Retrieved 2013-04-06. ^ "Fashion victim: rhabdomyolysis and bilateral peroneal and tibial neuropathies as a result of squatting in 'skinny jeans'". Journal of Neurology, Neurosurgery & Psychiatry. Retrieved 23 June 2015.